Starting today, March 15, 2016, you can activate the Chase Freedom’s 2nd quarter bonus categories, which are grocery stores and wholesale clubs! When you activate the bonus by June 14, 2016, you’ll earn 5X Chase Ultimate Rewards points (5% cash back) on up to $1,500 in spending in these categories from April 1, 2016, to June 30, 2016. Don’t worry! Activating the bonus now won’t deactivate your 1st quarter bonus spending at gas stations and on commuter transportation. You’ll still earn 5X points in those categories through March 31, 2016. Earn Extra Chase Ultimate Rewards Points With the Chase Freedom Next Quarter! I love it when the Chase Freedom has grocery stores as a category bonus! 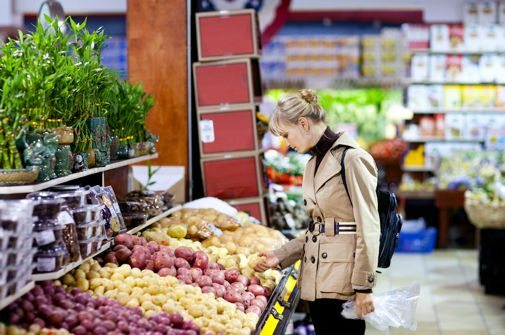 Most folks can easily make the most of the bonus with their everyday supermarket shopping! Note: You will NOT earn the bonus at Walmart and Target. I like that wholesale clubs like BJ’s and Sam’s Club are included! Because they sell much more than groceries! However, wholesale club gas and fuel purchases, or specialty services like travel, insurance, cell phone and home improvement, do NOT qualify for the bonus. In-store and online purchases are eligible for category bonus. Sam’s Club began accepting Visa cards in-store on February 1, 2016. And Costco will begin accepting Visa cards in-store on April 1, 2016. Update: Thanks to reader Kelly S for letting us know Costco has delayed accepting Visa cards until June 2016. But reader VM points out, you can purchase Costco cash cards (whcih you can use in-store) online with a Visa. I’m not sure if this will earn 5X points, so make a small test purchase first! You’ll earn 5X Chase Ultimate Rewards points (5% cash back) on up to $1,500 in spending between April 1, 2016, and June 30, 2016. But remember, you must activate the bonus by June 14, 2016. Even if you activate the bonus late in the quarter, it’s retroactive. So you’ll earn 5X Chase Ultimate Rewards points on bonus category purchases you made from April 1, 2016. If you spend the maximum, you’ll earn 7,500 Chase Ultimate Rewards points ($1,500 x 5 points per $1 you spend). That’s worth $75 in cash back. Sweeten the Deal If You Have Certain Cards! If you also have the Chase Sapphire Preferred, Chase Ink Plus, or Chase Ink Bold (no longer available) card, you can move Chase Ultimate Rewards points earned from the Chase Freedom to 1 of those accounts. And then transfer them to airline and hotel partners like United Airlines and Hyatt like Emily and I did on our spring break trip to Maui a few years back! Or use your Chase Ultimate Rewards points toward paid travel through the Chase Ultimate Rewards travel portal at a rate of 1.25 cents per point. That can be a good option if award seats or nights aren’t available, because there are no blackout dates. It’s great to earn 5X Chase Ultimate Rewards points for purchases I’d make anyway. When I buy cat food at the supermarket for Joey, I get closer to an award stay at Hyatt because I move the points to my Chase Sapphire Preferred. New to the Chase Freedom? I’ve kept the Chase Freedom in my wallet year after year because it has no annual fee and is a great way to earn lots of Chase Ultimate Rewards points. Keeping no-annual-fee cards like the Chase Freedom will increase the average age of your credit accounts and potentially improve your credit score. You’ll earn 15,000 Chase Ultimate Rewards points ($150 cash back) when you sign-up for the Chase Freedom and spend $500 on purchases in the 1st 3 months of opening your account. Here’s my full review of this offer. And you’ll earn an additional 2,500 Chase Ultimate Rewards points ($25 cash back) when you add an authorized user who makes a purchase in the same timeframe. Remember, Chase has changed their card application rules. If you’ve opened ~5 or more credit cards in the past 24 months, it’s unlikely you’ll be approved for any Chase Ultimate Rewards points-earning card, like the Chase Freedom. Looking for ideas on how to spend your points? See my posts on how to get $225 worth of flights with the Chase Freedom’s sign-up bonuses. And how to use it for Big Travel on Southwest, United Airlines, American Airlines, and at Hyatt hotels. You can buy Costco cash cards online with a visa then use them in the store or for gas. The online purchase counts for the wholesale club 5% category. Cards are mailed (free shipping). Tested and approved. @Ben, that’s great news. I have purchased on and it is still pending! tested. it worked. cash card with 5%. I have made a purchase at Costco.com on April 1st with my Chase Freedom card. My Costco cash card has been shipped out. But for some reason, the purchase didn’t show up on my Chase Freedom card yet. Not even pending. I’m still waiting for the purchase posted, then I can know if it’s qualify for the 5%. I will update once I know. Probably somewhere around April 8th.